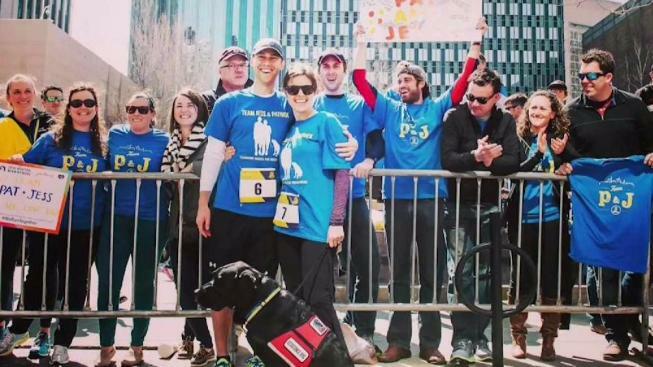 Jessica Kensky and Patrick Downes were a newlywed couple in 2015 when they each lost a leg in the Boston Marathon bombings. For Jessica Kensky and Patrick Downes, the past five years have been an incredibly difficult journey they never would have chosen. “We were just at the you know wrong place, wrong time on this horrific day,” said Kensky. The then newlywed couple each lost a leg in the Boston Marathon bombings, and two years later, Kensky had to make the excruciatingly difficult decision to amputate her remaining leg. “When we had no words left for each other, we would always go out and just throw a ball for Rescue,” Kensky said. Rescue is Kensky's service dog, a nearly 6-year-old black lab from the Princeton-based organization NEADS. Rescue's goofy personality has been just as therapeutic as his ability to help navigate the world as a double amputee, which admittedly hasn’t always been easy. “When we were out in public, and a kid would see our prosthetics and Rescue, you could just see their eyes popping out of their head, you could tell they were bursting to ask questions,” Downes said. So when a friend suggested they write a children’s book about Rescue and Kensky, it seemed like a natural fit. “It reminded us that we had brains that worked and perhaps we could make some meaning out of something that felt so hard to grasp,” Downes said. In an effort to relate to young readers, Kensky's character in the book is a child. They decided not to focus on how Kensky was hurt, but how she and Rescue helped each other heal. For illustrator Scott Magoon of Reading, bringing Rescue and young Kensky to life was more than just a job. He wasn’t physically injured while running in 2013, but Magoon left searching for meaning that he has now found through his work on the book and by running the marathon this year to raise money for NEADS through the team Rescue’s Racers. "That has been the true joy for me is helping them heal,” he said. It's a journey of healing that they’re now sharing with the world. And in addition to Magoon running the marathon this year, Downes will be joining him, hand-cycling it for his fourth time. The book “Rescue & Jessica: A Life-Changing Friendship” went on sale Tuesday. Part of the proceeds of the book are going back to NEADS to help someone else who may be in need of a dog to help “rescue” them.